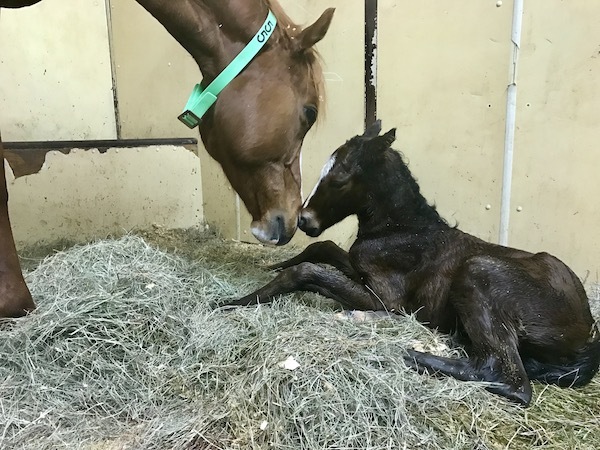 Spring is the peak of foaling season, so we wanted to share a bit about the first steps post-foaling at Royal Vista Ranches. When it comes to foaling, time is always of the essence, which is why we have a foaling attendant or manager onsite 24 hrs a day--as well as a vet on call. 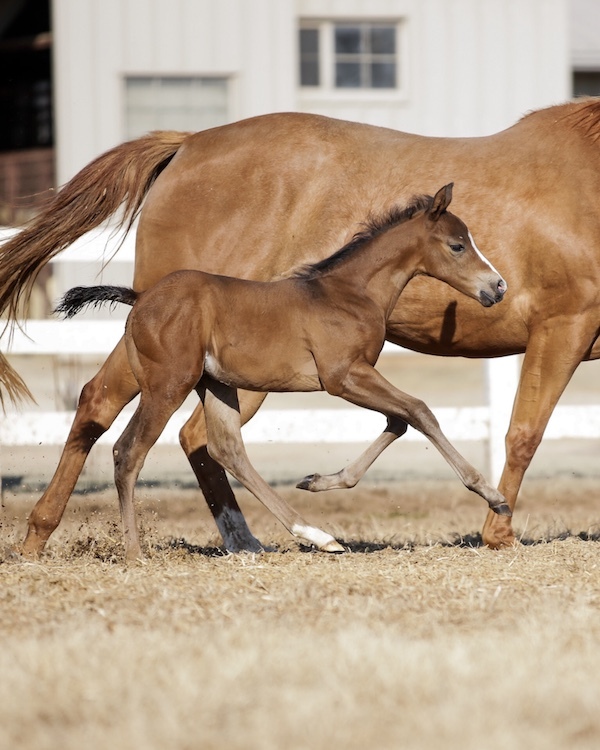 As soon as a foal is born, it is important to work to build up its immunity faster than infectious agents are picked up. Newborn foals do not have the antibodies to protect themselves until they have consumed and absorbed them through the colostrum--or first milk. Exposure to infectious agents can be found everywhere in the foal's new environment--the stall as it works to stand and the mare as it licks and nuzzles trying to find its first meal are just a few. At this point, the foal's digestive track and umbilicus are the most open and susceptible to infectious agents. Our goal is to help all our foals get ahead of the game by taking steps to prevent infection and exposure to infectious agents, including: providing a clean, well-bedded stall, using a 1:6 dilution of chlorahexadine (Nolvasan) for repeated navel treatment and initially cleansing the mare's udder prior to nursing, colostrum testing to ensure adequate antibodies are present in the mare's milk, administering an enema(s) to help prevent meconium impactions, and starting foals on a 5-day regimen of Trimethoprim/sulfamethoxazole and Metronidazole--which are oral antibiotics to help prevent infection. 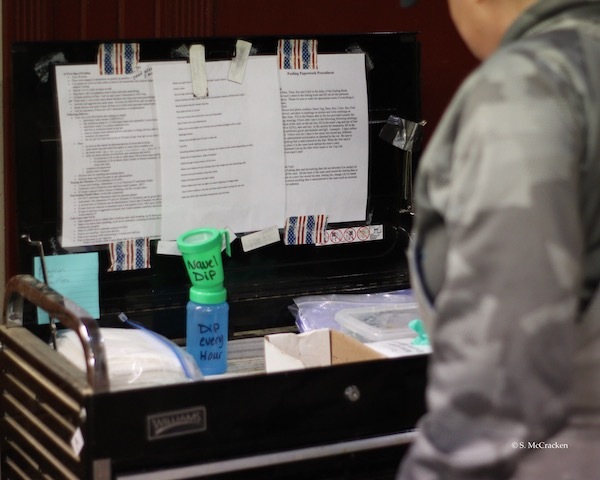 Here at the ranch, the mare’s colostrum is checked with a refractometer immediately after foaling to evaluate its quality and give us an idea on whether the foal will need supplemental colostrum. Great colostrum will test 32+% on the refractometer. We have found that, generally, if the mare’s colostrum tests 23% or higher and the foal nurses well, odds are it will have an adequate IgG when its blood is later tested. However, if the mare’s colostrum tests at 20% or below, the foals IgG will typically be low, and it will need supplemental colostrum or plasma. If the mare’s colostrum is of poor quality, we have found that it is beneficial to tube the foal with banked (previously frozen and stored) high quality colostrum sooner rather than later. A sample is taken from each mare just after foaling to check colostrum quality. 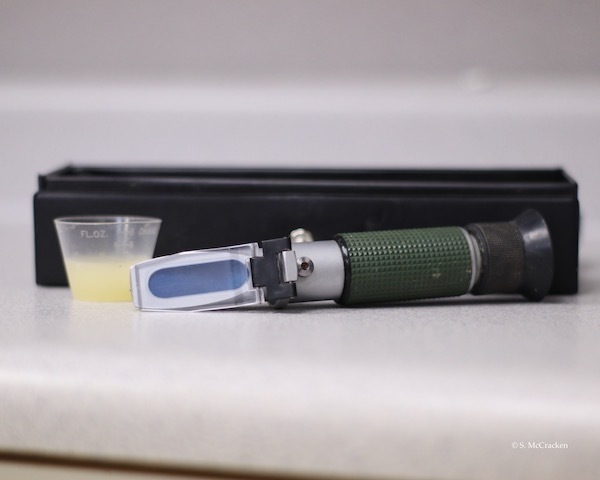 A refractometer is used to test colostrum quality. Additionally, we test the blood of all foals at 10 hours of age to determine its IgG level. We have an on-farm test kit that allows us to determine IgG results within about 15 minutes. The goal is to have the IgG be higher than 800mg/dl. If the level is below the desired 800mg/dl, we can administer high-quality, banked colostrum previously frozen from another mare. The foal’s ability to absorb the antibodies from the intestine ​is best until right at 12 hours old​, at which point absorption quickly declines until there is virtually none after the foal reaches 18-24 hours of age. Due to this limited window, if oral administration of antibodies is to be successful, it must be done quickly. The foal’s blood can be retested four hours after the last oral administration or virtually immediately after IV (intravenous) administration of plasma to determine current IgG status. 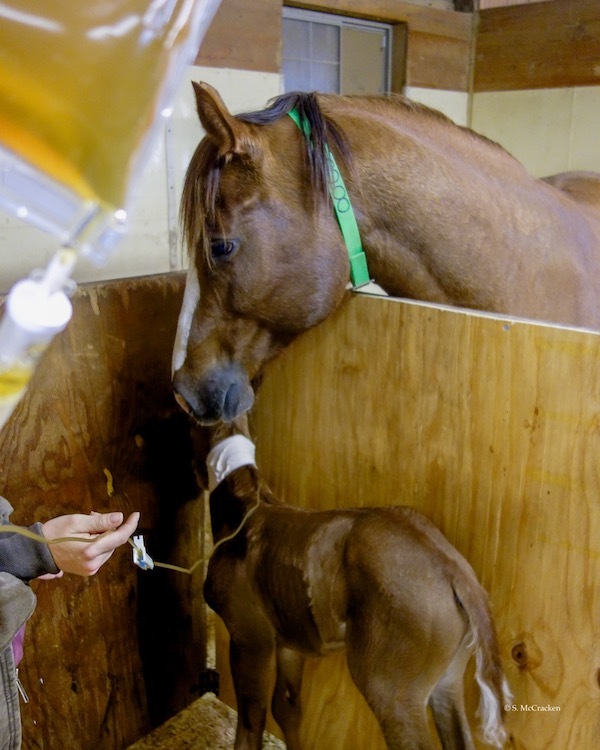 Newborn foal receiviing plasma to boost antibody protection. If the window of opportunity for GI absorption is missed or if the foal needs additional antibodies, then IV antibodies in the form of plasma can be given. Most owners of foals at Royal Vista Ranches elect to boost their foal’s antibody protection against Rhodococcus equi (R.equi) by having 1.5 liters of hyper-immune plasma administered within 24 hours of foaling. R.equi can cause pneumonia in foals and the administration of hyper-immune plasma has been shown to reduce the severity and frequency of pneumonia. In the end, it's always our goal to get foals up, nursing and off to the best start possible. Research and experience have shown that those early hours and days are critical. This is why we take every step and precaution to ensure things get off on right foot, so that foals can be outside enjoying sunshine and fresh air as soon as possible. Young, healthy foal outside enjoying sunshine. Thanks for taking the time to learn a little bit more about the foaling process here at Royal Vista Ranches. If you have questions regarding this article or ideas for what you'd like to learn more about regardin breeding, foaling or Royal Vista Ranches, feel free to drop us an email at info@royalvistaranches.com or shoot us a message on our Facebook or Instagram page.